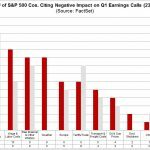 Earnings season isn’t the only factor affecting stocks. If it was, stocks wouldn’t have corrected during Q4 2017 earnings season in early 2018 as estimates were being raised and they wouldn’t be rallying now as estimates are cratering. 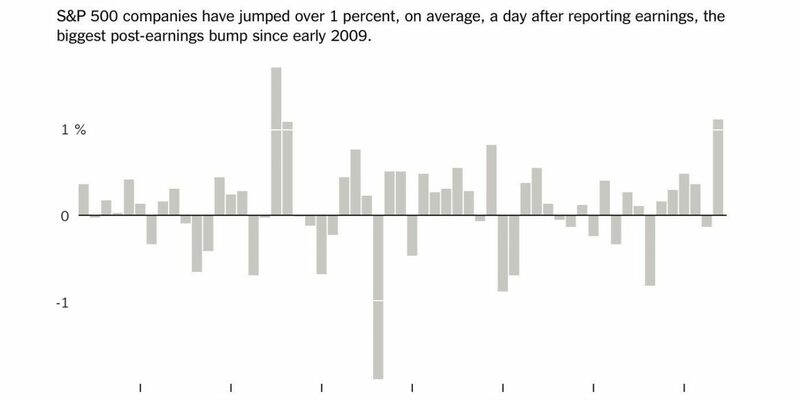 As you can see from the chart below, S&P 500 firms are up more than 1% on average the day after reporting earnings which is the best performance since 2009. There is faulty analysis done when analysts look at earnings beats versus misses instead of changes to guidance. However, this isn’t the case with this chart because it includes all companies. We’ve seen strong growth in Q4 as we will review, but estimates are dropping rapidly. You wouldn’t expect stocks to rally with crashing estimates. We will review catalysts for this rally later in this article. First let’s review the earnings reports that investors are loving the most since 2009. As you can see from the chart below, with 281 firms reporting results, EPS growth is 17.82% which is way below the last 3 quarters which had above 27% growth partially because of the tax cut. To be fair, the 2 year growth stack hasn’t fallen much as this quarter is dealing with tougher comparisons. The 2 year growth stack was 39.39% last quarter and it is 34.37% this quarter. Sales growth similarly fell as it has a 6 handle now unlike the double digit growth of the last 3 quarters. The 2 year stack has fallen from 17.46% to 16.65%. That’s a relatively minor slowdown. It makes the data look better. Since this chart has been published 9 firms have reported earnings, which has pushed EPS growth up to 17.9% and sales growth down to 6.8%. 70% of firms have beaten EPS growth and 62% have beaten sales estimates. The table below shows the Earnings Scout’s calculation of earnings estimates. They are slightly different from the FactSet data we reviewed in a previous article. The blended estimate for Q4 earnings growth is 12%. That’s up from 10.13% as of January 30th because firms are beating estimates. As the table shows, Q1 EPS estimates have fallen from 5.54% at the start of the year to just 1.8%. 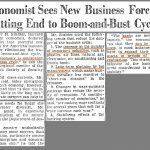 Even if estimates call for a slight decline in 2019, growth would be positive because most firms beat estimates. Stocks can easily rally while estimates fall, but when estimates fall so much that growth is negative, it’s not good for stocks. Multiples will soar if stocks keep rallying while earnings growth is nonexistent. One of the main reasons stocks have risen this much this earnings season is the same reason stocks rallied in 2009: they were coming off very oversold levels. According to Nomura, there was a negative shock to global equities late last year as the standard deviation fell below -2. Global stocks have only modestly outperformed the average shock since 2009. This shock troughed at a lower level than average. The table below shows the results of American equities after similar shocks. It shows the points since 2001 with the lowest percentage of stocks in the S&P 500 above their 50 day moving average. As you can see, on Christmas Eve 2018 there were only 1.2% of stocks in the S&P 500 above their 50 day moving average. That’s tied with two points in October 2008, which was the worst month of the financial crisis. It’s quite amazing to see stocks as oversold as October 2008 considering there is no evidence the economy was in a recession in late 2018. The latest Atlanta Fed Nowcast projects Q4 2018 GDP growth was 2.7% which is quite good actually. As the table shows, every single instance on this list has positive returns in the next 12 months, with the lowest gain being 9.9%. The one month gain in this rally is the 4th best on this list. Keep in mind, this list only has oversold moments in 2002, 2008, 2011, and 2018, so the data set isn’t enormous. The point we’re making is stocks usually rally after being oversold. This is overcoming the weakness in earnings estimates which was more than priced in at the Christmas Eve bottom. Another reason stocks are doing well is American growth is outperforming most developed countries. As you can see from the table below, America’s Markit services PMI in January was better than every country on this list except Russia, Spain, and Switzerland. The PMI fell from 54.4 to 54.2, meeting estimates. It was weaker than the manufacturing PMI, but still showed growth consistent with 2.5% GDP growth. American activity expansion was the softest in 4 months. 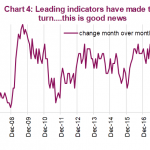 New order growth was the same as December 2018 which had the weakest growth since October 2017. Just like with manufacturing, America’s PMI was higher than the global PMI. The global PMI hit a 28 month low as it fell from 53 to 52.6. Furthermore, the new business index fell from 53.1 to 52.5. 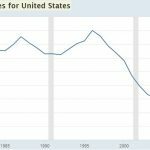 New export business is now contracting as trade growth is slowing. The index declined from 50.1 to 49.8. Just like in the global manufacturing report, future activity improved; it rose 1 point to 63.1. Moderate inflation is great for U.S. stocks because it allows the Fed to pause rate hikes. According to the Markit services report, the prices paid index hit a 22 month low. The chart below shows the 3 month average of net businesses reporting that commodity prices were up in the ISM services and manufacturing reports. As you can see, it has fallen sharply which suggests CPI growth may have also fallen in January. 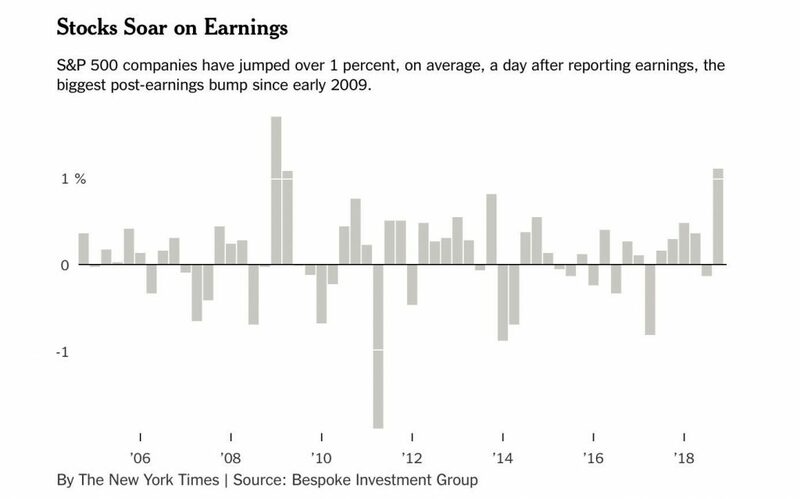 Even though the terrible earnings estimate revisions imply the consensus will soon expect earnings to fall in 2019, stocks are doing the best after they report earnings since 2009. That’s because stocks entered the year very oversold as only 1.2% of firms were above their 50 day moving average on Christmas Eve. It’s also because the American economy is relatively strong. The US services PMI is still above the global PMI even though it fell in January. Finally, inflation has been tepid which allowed the Fed to stop raising rates for the time being.